BookTini is a social club who reads and drinks together, but we give back to our communities by spreading the gift of literacy through charity. Previously, chapters have provided backpacks full of books to children preparing for the school year, donated books to schools and after school programs, volunteered at literary events, and donated a small library to a local barbershop. This year, BookTini moved toward having a national community service project designed for all chapters to participate to make a greater impact. Led by our National Community Service Chair. Toya Davis, members were encouraged to coordinate a summer book club designed for young girls. Chapters had a full range of options, from having a one day read-in event, to multiple meetings throughout the summer. Our Oakland/East Bay planned Cupcakes & Discussion for girls entering 4th through 6th grades. The girls met up to discuss Sugar Plum Ballerinas: Dancing Diva at Cerrito Vista Park in El Cerrito, CA over personalized cupcakes and beverages. They played ice breaker games, discussed the reading selection, played more games, and were treated to a short presentation on fun ways to use the library. The girls each left with backpacks full of school supplies and a comfy handmade pillow in BookTini’s bright purple and teal club colors. Our Carson, CA chapter met three times over the summer with participants ranging in age from 5 to 15 years old. The young girls read and discussed Little Professor Syke: Favorite Things, One Crazy Summer, and When The Black Girl Sings. During their various meetings, the girls were treated to smoothies from Juice-C Juice Books & More, lunch at the Long Beach Pier, and a pizza pool party to round out their last book club meeting. The girls also recieved backpacks full of school supplies, journals, bookmarks and a certificate of completion, all donated by chapter members. Carson’s Community Service Project Chair, Aprile Benjamin, shared that they loved their experience providing a fun book club for their participants: "Our young girls were so cute as they tried expressing their favorite character and most exciting moment from their books. It was our pleasure to facilitate the girls' book club and we look forward to doing this next year." 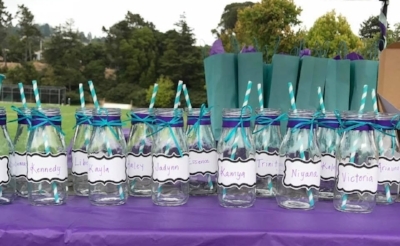 Our Fremont, CA chapter met with their summer girls book club in June, July, and August to discuss June Peters, You Will Change the World, One Crazy Summer, and Stella by Starlight, with attendees ranging in age from 7 to 15 years old. The chapter partnered with the American Heart Association who provided the girls with a free CPR training in June, and also with the Rho Delta Omega Chapter of Alpha Kappa Alpha Sorority, Inc., who provided a free viewing of the documentary, STEP, in August. The girls were also given backpacks and school supplies donated by the Iota Beta Sigma chapter of Sigma Gamma Rho Sorority, Inc., and the Eta Rho Omega chapter of Alpha Kappa Alpha Sorority, Inc.
Snacks and certificates of completion were sponsored by BookTini-Fremont members and Antioch Baptist Church’s ABC Book Club in San Jose. Erika Albury, Fremont’s chapter founder and Community Service Chair felt that the project was well worth the work. "Being able to engage, encourage and serve young ladies who share an excitement for reading has been rewarding. To have parents, organizations and BookTini trust us in guiding the young ladies is overwhelming and humbling." The Fremont chapter also partnered with the San Jose chapter of Jack & Jill of America, the San Jose Alumnae Chapter of Delta Sigma Theta Sorority, Inc., and The African American Community Service Agency. Lastly, our Sacramento chapter put on our largest project this summer. They served girls ranging in age from 4 to 18 years old, with elementary and middle school aged girls being led by the high school aged participants. The girls read books based on their reading level throughout each month in the summer. Titles ranged from Nicola Yoon’s Everything, Everything for advanced readers and Imani’s Moon by Janay Brown Wood for beginners, with each month serving a different theme. The high school leaders also participated in their own book club prior to leading their meetings with their younger counterparts. Our Sacramento chapter partnered with the National Coalition of 100 Black Women, Inc’s Sacramento chapter and their Fostering Hope program. Sacramento chapter’s Community Service Chair, Michele Rogers-Toure, feels this summer project will leave a lasting impression on their participants. “The purpose of the Summer Girls Book Club is to cultivate readers into leaders. We had an awesome time getting together and supporting the young ladies on their continued journey of black girl magic.” The Sacramento chapter served nearly 40 young girls, who all left with new backpacks, school supplies, books, and participation certificates. Their young high school leaders also left with a monetary gift donated by NCBW. Our first ever national community service project was a success. We can’t wait to see what our ladies have in store for 2018.